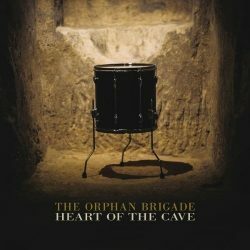 The Orphan Brigade’s ‘The Heart of the Cave’ is about as aptly titled a record as it’s possible to get seeing as it was recorded it in 2,500 year caves below the streets of Osimo, Italy. The Brigade’s previous outing, the award winning ‘Soundtrack to a Ghost Story,’ was the brainchild of producer Neilson Hubbard in collaboration with Ben Glover and fellow singer-songwriter, Joshua Britt. It was inspired by a time – the American Civil War – and place, Octagon Hall, a supposedly haunted plantation house near Franklin, Kentucky. Octagon Hall was offered as a shelter to 12,500 Confederate soldiers during the Civil War. It’s also said that some of these soldiers were hidden in the house while it was occupied by federal troops. One soldier who lost a leg due to a gunshot wound was cloistered in the attic when Union soldiers came to the house. It sounds something akin to Clint Eastwood hiding out in the film, ‘the Beguiled.’ As there’s rumoured to be a secret tunnel that led from the basement of the house to a neighbouring barn, the Ghost Story soundtrack may well have formed part of the inspiration behind the decision to record this latest release in the caves and tunnels beneath Osimo. The opening track on the album, ‘Pile of Bones,’ is a lovely reflection on mortality, featuring a drum beat, shaker, and a howling choir whose voices rises in unison to the chant of “We ain’t leaving but a pile of bones / We ain’t leaving no more.” It’s a terrific opener, but then did I mention that in addition to Ben Glover, Neilson Hubbard, and Josh Britt the Orphan Brigade features such luminaries as Gretchen Peters and Will Kimbrough? How wouldn’t an album with so many talents not be anything other than a landmark event. The second song, ‘Town of a Hundred Churches,’ is equally as strong – piano led with tambourine accompaniment and Josh Britt’s lovely mandolin, a feature of the record throughout. Furthermore, the combined “oh ohs” of the wondrous backing vocals provided by Natalie Schlabs, Audrey Spillman, Kira Small, Gretchen Peters, and Heather Donegan that book end each verse only add to the overall spine-tingling effect of what’s a virtually perfect production by Neilson Hubbard. The song which follows, ‘Osimo (Come to Life)’: “Bury me beneath the streets of Osimo / I come to life…” was the first song the Orphan Brigade collaborated on when they first ventured into the tunnels and caves below Osimo, and as a dedication to this special place, is as haunting and mesmerising a song as any on the rest of this album. The “wooah oohs” that feature in the song, ‘Alchemy,’ and the repeated chant of “The Bells Are Ringing” from the eponymously titled song, sound similar to Arcade Fire at their best on the album ‘Funeral,’ with more mandolin accompaniment from Josh Britt. With this album, the Orphan Brigade have also taken flight – and in the most magical way possible.